We really like granola. It may be the fact that I can’t really eat cereal anymore or that we also really love yogurt (granola pairs so well with it). Whatever the case, it’s gotten to the point that as soon as we run out, Jon asks when we’re going to make granola again. And even though I’ve got two great recipes already, I’m always excited to try a new kind. This cardamom hazelnut from Naturally Ella was a great one – the cardamom and hazelnut an absolutely delicious new twist to one of our very favorite snacks. Paired with pumpkin spice skyr? Man, fall tastes good. 1. Preheat oven to 300 degrees F and cover one large or two small baking sheets with parchment paper or a silpat. 2. Place hazelnuts in a food processor and pulse until the nuts are in small pieces but not quite the consistency of meal. Place in a large bowl along with the rolled oats and sea salt. 3. In a small sauce pan, combine cardamom, orange zest, honey, and butter/oil. Heat over low heat until butter is melted and cardamom is fragrant. Pour over the oat mixture and stir until everything is well coated. 4. 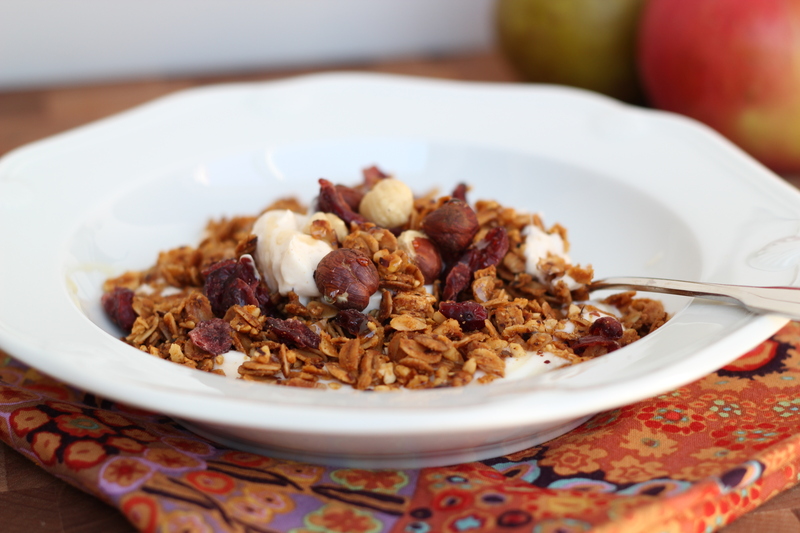 Spread granola onto baking sheet(s) and press into a thin layer. Place in oven and bake for 45-55 minutes, stirring every 20 minutes or so. 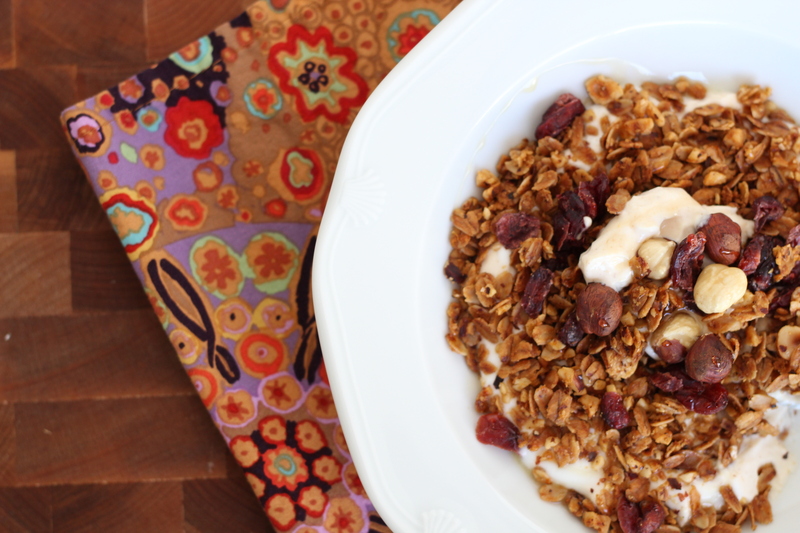 Granola should be golden in color. Remove from oven and let cool. Pour into a bowl and stir in dried cranberries. 5. Store in an airtight container for up to 2 weeks. I am a granola snob. It’s my absolute favorite food and I have tiers of granola rankings to sort out the good from the great. This flavor combination looks spectacular! Can’t wait to try it!